Lipno area belongs to one of the oldest and very famous location in the Czech Republic. It is said, that Lipno area is the most beautiful region in the Czech Republic at all. It is situated in South Bohemia just next to the boarders with Austria and the east part intervene in Bohemian Forest range. The Lipno Lake is situated in pictorial landscape full of forests and meadows, where you can easily find horses, cows and calf. You are very welcome to visit this area and spend your free time. We are pleased to offer you accommodations in Lipno area Hory, excellent fish specialties in our restaurant and also fishing in our lakes. We promise, that you will enjoy your holiday in Lipno area. Fish restaurant - web pages of Fish restaurant Hůrka at the Lipno Lake. You are welcome to visit our restaurant, where you can eat excellent fish specialties prepared only from fresh fish. 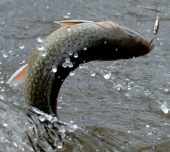 (carp, trout, catfish and pikeperch). Fishing - Our lakes are special place for angling lovers, who likes to catch trout, carps, amurs and tenchs. All pictures are copyright Jaroslav Tichy.